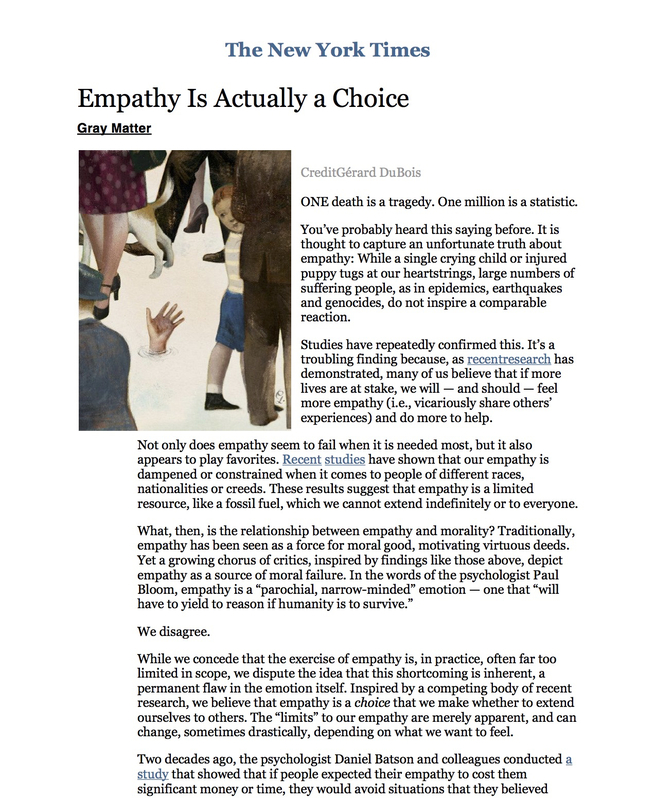 In this New York Times article, empathy is wisely presented as a choice. It is important to develop your empathy but also learn ways not to be drained by the stress of the world. Then empathic people can stay in their power and be positive forces to change themselves and the world. Empaths represent a new model for leadership by being vulnerable and strong. We can have a huge effect on humanity by promoting mutual understanding, the path to peace in our personal lives and globally. But such revolutions will stick only when the inner emotional and spiritual work is done by the revolutionaries. Then outer positive political, social, and environmental changes are possible. Through our sensitivity we can create a compassion revolution and save the world. Empaths are pivotal to the shift that the Dalai Lama speaks of. Sensitivity is the path to non-violence. We can be the healers and restorers and seers and lovers if we keep our sensitivities open and stay centered in our power. We don’t have to be afraid of who we are. My advice to you is: do good and be good–the rest will follow. A commitment to to this goal is critical because there is a quickening in the world, a speeding up of time that some mystics say will bring a reckoning of light versus dark on our planet. We need to take a stand. The more empowered you become, the more you can embody the change that the world needs. Throughout your life, keep clarifying the ways your empathy has served you, others, or the greater whole. The following exercise will help you remember these instances of empathy-in- action and is a way of saying “thank-you” to your gift. 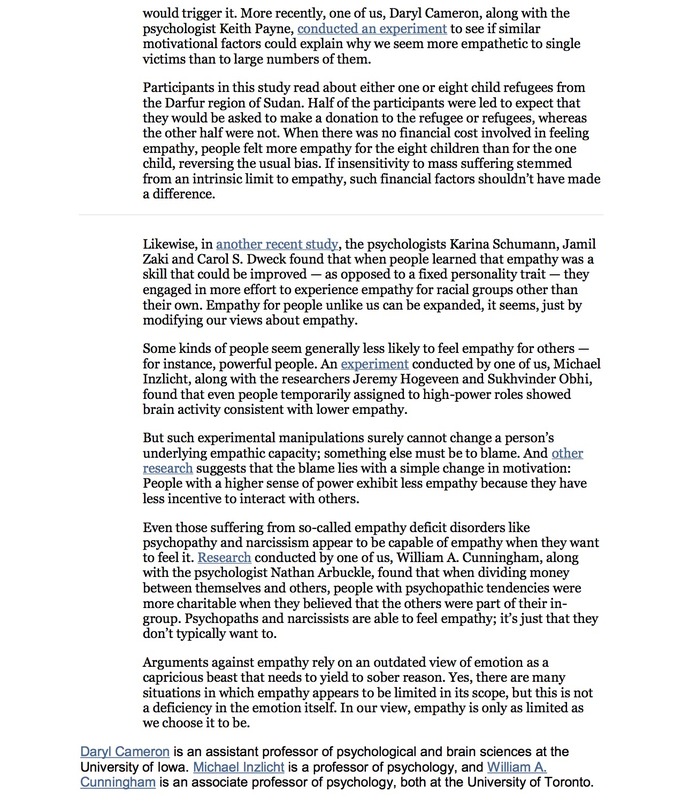 Empathy can be helpful many times each day. Take a moment to reflect on the benefits it has offered.  Remember a time when you were able to empathize with your spouse’s pain and you helped him or her with the depth of love you offered.  Remember a time when you tuned into your intuition, and you just knew what the best choice was. By listening to your inner voice, you were able to pick the right job, the the rightrelationships, or the right teacher.  Remember a time when you were afraid, and you didn’t know what to do. But instead of putting yourself down or obsessing on the fear, you showed empathy and compassion for yourself. This loving attitude got you through the fearful period.  Remember a time when a friend experienced a terrible relationship breakup and you were supportive and loved her though her pain.  Remember how, as a parent, you were able to encourage your children to express their sensitivities and not be ashamed of them. Be happy that you could enhance your children’s lives in this way. In addition to recognizing and embracing your own gifts, I also recommend finding a community of like-minded people to relate to. Sensitive souls are, by nature, what I call “co- empathic,” which means our sensitivities can be amplified in wonderful ways by being around other positive, sensitive people. In these special situations, the power of ten is greater than the power of one. To reinforce each other’s gifts and offer mutual understanding, I encourage you to form empath support groups in your location, which can consist of a few people or more. The beauty of community is that we can help one another.